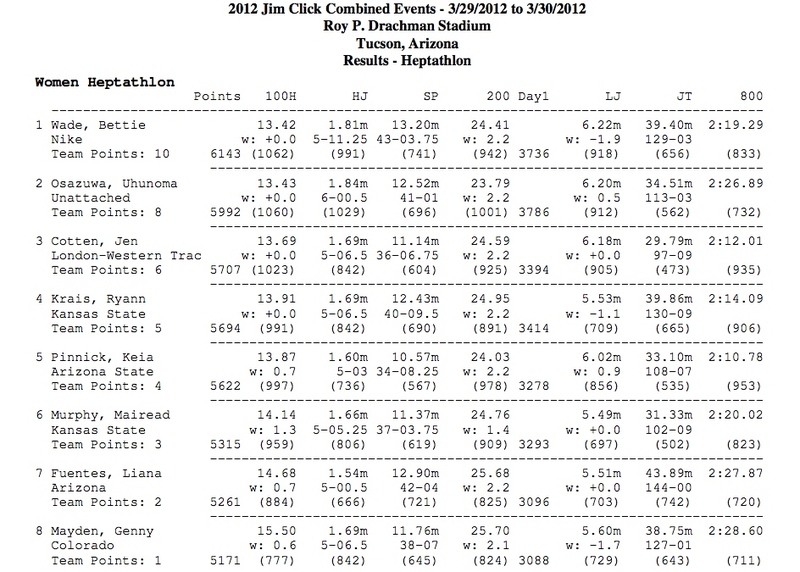 It feels great to have the first heptathlon of the year behind me, especially when it comes with a personal best score and some pleasing results! I’m incredibly excited to see what I’m capable of this summer. If I can start my season beyond where I left off last year, then who’s to say how many more points are in store for me in 2012! Setting new personal bests right off the gun is unusual in track and field. You see, an athlete’s training plan is designed to set her or him up to peak for a final performance of the season, for example FISU games last summer, before taking adequate time off to fully recover mentally, physically, and emotionally. The dawn of a new season begins with base training in the fall. High volume weeks both in the weight room and on the trails and hills rebuild fitness and general strength. Fitness and strength are the keys to effective and injury-free training and competition down the road. After months of grinding out brutal workouts in the base training phase, assuming the adoption of an effective recovery regime, an athlete’s body is stronger than ever. Event specific technique, on the other hand is probably rusty without much on-track practice, and quick speed may understandably be lacking. Thus, the first meet of the year usually sees results that are a step back from those at the end of the previous season. So the main goal when anxiously stepping up to the line for the first meet is not to have a career best performance, but to be further along than you were at the beginning of the previous year. Overall pbs are always being chased, but realistically they are rarely achieved at the outset. Let me tell you, it is a very difficult feeling when you put in countless hours of work, and are faced with the fact that your body is not exactly race-ready. It’s discouraging to ask your body to respond a certain way, and come up short. Yet experience is a wonderful teacher, and patience and perseverance play a huge role at the start of a season. This has been the first occasion where I didn’t give any thought to attaining new personal bests…so imagine my surprise when I found myself either setting new pbs, or tying previous ones in four of the seven events (hurdles, high jump, shot put, and 800m)! Focus on what you can control, and the results will take care of themselves! Congrats to my training partner, Damian Warner, who came away with the win and achieved Olympic B standard in the men’s decathlon! Here’s one last panorama from the trip, taken from the back porch of the house we stayed at. Canadian coach Brett is relaxing too, and Damian’s checking out his new javelins. Be sure to check out the other shots too!